Hello! 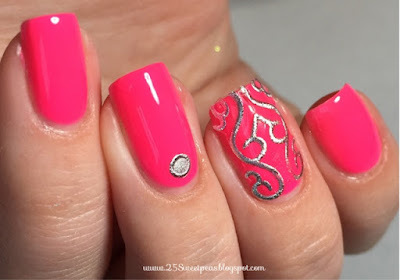 So today I have a couple of fun nails for you! 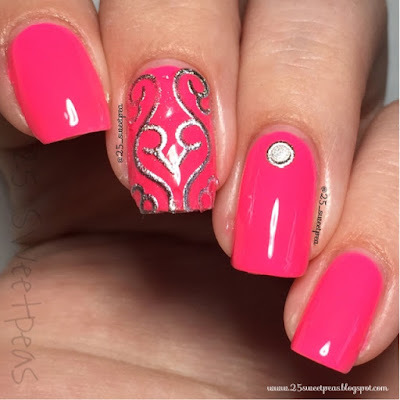 First off I received a fun sheet of silver embossed 3D nail art stickers from the Born Pretty Store. They came in a huge sheet with all different designs! So I have 3 different looks done with them for today. In this look I used 2 different stickers from the set. The full nail one, is a long rectangular sticker that I trimmed down to fit my nail. The next on is just the little dot. 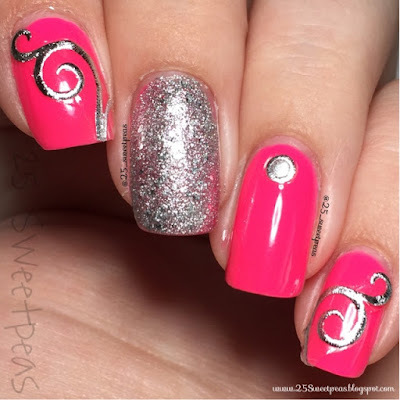 I love the simplicity look this mani has. Very simple yet very intricate. 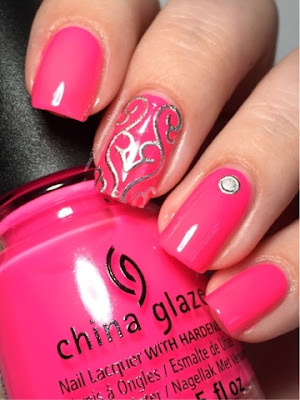 The beautiful pink I used is a neon from China Glaze called Heat Index. It's a really lovely pink neon. I'm a big fan of it at the moment! It takes about 2 coats and then a must have top coat since it is matte. I really liked the look of this so I have a few pictures of it. What do you think of this look? I did notice that the full nail sticker didn't work very well with top coat. The other one is perfect but with the bigger one I had some issues with getting the edge real smooth, and it snagged on things. So after that last look I took of the full sticker nail and added SpaRitual Charleston. Probably my favorite silver glitter. It wears nicely and comes off easily with remover. Very fun, and do able. I then added another set of stickers! These we much easier to wear and I love the look! I did have a bit of issues with applying them and not getting little air bubbles.